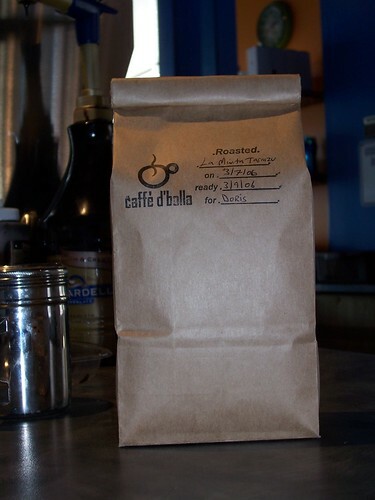 As of March 6th we are now roasting whole bean coffee to order. Orders placed on Monday and Tuesday will be roasted on Tuesday. Orders placed on Wednesday and Thursday will be roasted on Thursday. Friday-Sunday are used to roast and test new blends for the caffe. Doris was our first whole bean customer. She comes in every morning and either gets fresh brewed press pot coffee or an Americano. She got a pound for her book club. I trust all will go well. I just finished todays’ roasting for the newest group of our fantastic customers. Come enjoy some fantastic fresh roasted whole bean coffee. You’ll love it!